The Kuks – Pomegranate project was initiated and coordinated by the National Heritage Institute in the Czech Republic and with support from the European Regional Development Fund. The site, built in the early 18th century, is comprised of the residence of Franz Anton von Sporck, built close to the medicinal springs of the nearby river Elbe as well as a spa, a hospital, a church, a cemetery, a pharmacy and sprawling gardens with herb garden, follies and fountains found within. Much of the complex was in an unfortunate condition with the vast majority of the buildings completely unsuitable for use. The complex represents an outstanding example of Baroque architecture and interior decoration and embodies Baroque ideals in its symbolic physical arrangement. The Baroque fascination with opposites, life, and death is evident in the way in which those buildings dedicated to youth and life, that is the chateau, the theatre and spa are located on one side of the valley while those devoted to spirituality, aging and death such as the hospital, church, and cemetery are located on the opposite bank. 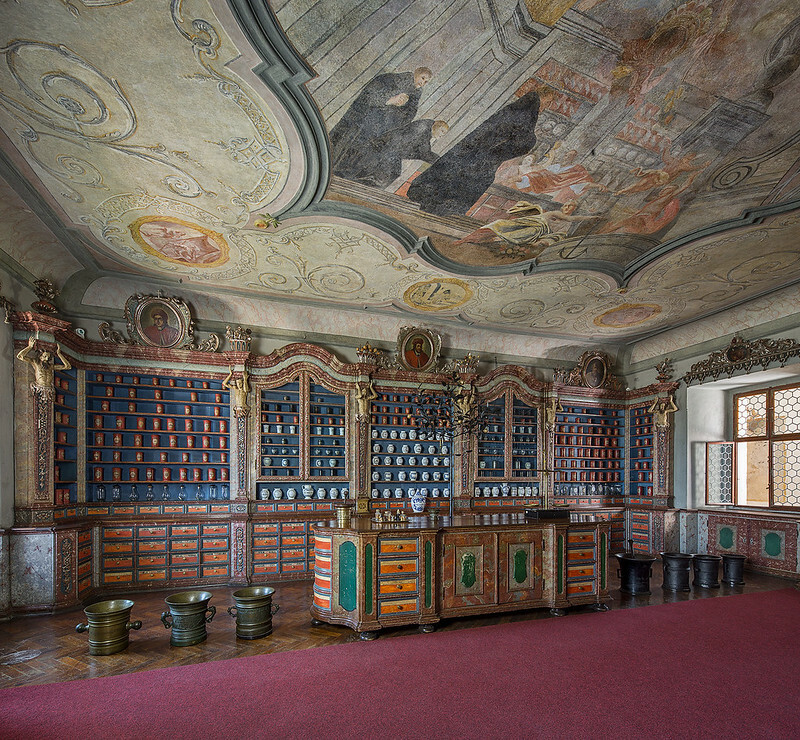 The hospital and pharmacy have had a remarkable history, having functioned as such from 1743 until the occupation of Czechoslovakian territory in 1938. After 1938, a district penitentiary was established there for German juvenile boys. In the second half of the 20th century, the building was a hospital for the chronically ill as well as a branch of the regional archives. The Kuks – Pomegranate project, its name taken from the pharmacy, was undertaken for the purpose of building an educational centre focused on this fascinating history of the complex, for hospital activities, the presentation of a historical and contemporary pharmacy and the cultural and artistic aspects of the building. “ The restoration work of the Kuks hospital, an integrated project of building and landscape conservation, is of the highest quality. Its multi-, interdisciplinary approach is commendable and should serve as a strong example for conservation projects across Europe, ” said the jury. “The building and its history are important in a European context as the site tells a story which is conveyed through its educational program. Its continued use in a pharmaceutical function is significant. Hospitals frequently present a complicated set of issues in conservation as they are continually in need of restoration and technological advances. The Kuks – Pomegranate project presents a solution which is well adapted to the new demands of the building while preserving what is present of its history,” commented the jury.